Since we already covered the principles behind the ADA here: Common violations for ADA Accommodations regarding Parking and Path of Travel, we won’t go over the principles again. You can click to skip ahead: Get me to the ADA Accommodations! Otherwise you can read the copied text below. The slope for both the access aisle and the parking space need to be on the same level AND the slopes cannot be greater than 1:48 inches in any direction. If your parking space slumps, we would recommend that you either consider locating your accessible parking elsewhere, or that you try and level the space. Van lifts won’t deploy if it detects that the ground is uneven. Signs should be clearly visible to drivers who want to park in the space. The signs should NOT say “handicapped” (California, Vehicle Code § 22511). You should replace your sign if it says this, as a lawsuit costs far more than replacing the sign. Sign heights for CA and the ADA are different, but in general the bottom edge of your sign should be above 80 inches when in the path of travel. Many business owners seem to think this is funny, asking if they can place the sign at 13 feet above grade. There is no upper limit, but again the sign needs to be visible to on-coming drivers. Bewarned: This list is not exhaustive. Also be aware that laws do change. This list may become inaccurate. I’ll try to remember to update it, but if you’re reading this list a year from now, be warned that it may be faulty, especially if the California Code of Regulations Title 24 changes (which is the next known update). No slopes greater than 5% without handrails. Slopes greater than 5% require handrails and are considered ramps. Door landings do different in size, but in general, each door landing with its latch-side clearance needs to have a steepness no greater than 1:48 in any direction. At least one of each type of good or service must be located on the path of travel so that everyone has access to it. This means that a bar upstairs doesn’t need to be accessible if there is an identical bar on the first floor (AND if all the amenities are the same. This means that if a private party rents out the upstairs area, there is potential for a lawsuit). The California Building Code requires at least 48 inches of width along external paths of travel with a recommendation of 60 inches. For existing buildings this can go down to 36 inches for the ADA depending on hardship. Objects which protrude into the pedestrian envelope greater than 4 inches for wall mounted objects (12 inches for post mounted) are considered hazards in the path of travel. A path of travel should be devoid of these objects. The area of projection is in general, between 27 and 80 inches above the finished floor. This means that doorways that are lower than 80 inches are considered hazards. Common protruding objects include fire extinguishers, signs and counters. The cross-slope for a path of travel cannot be greater than 1:48 inches. Detectable warnings are required under the California Building Code for vehicular hazard areas and transit platforms. This requirement isn’t included under the ADA 2010 but it is included in the ADAAG 2004 and will probably be reintroduced under the Public Right of Way Access Guide which is supposed to come out soon. No change in vertical level greater than 1/2 inch is allowed. Changes in level between 1/4 and 1/2 inches should be beveled at a 45 degree slope. Like the list above for parking, this list is not exhaustive and may change as laws and regulations change. So be warned if you want to use this to assess your site. Nonetheless, this gives you some idea of what some of the requirements are. Picture #1 and #2: I think for most individuals who are disabled, this photo speaks for itself. For those of you who don’t understand though, the accessible path of travel needs to be a continuous path from the access aisle to the main entrance. This is for the safety of the pedestrian and to alert the driver that this is an area they should be aware of as a pedestrian right of way. The same goes for this second picture which has no access path outline. A larger issue with this second picture has to do with the location of the access aisles. In this image the aisles are not located on the passenger or driver sides, where disabled individuals actually get in and out of the vehicle. Because maneuvering in and out of a vehicle requires more time and space than normal travel, an access aisle is required by law to prevent vehicles from encroaching onto that space. This photo is of a parking space that has an access aisle on both the right and left sides. This is in excess of requirements. Nonetheless, there are two obvious barriers in this photo. If you look at the passenger side, this access aisle abuts the driveway. Driveways are not accessible routes. So to provide safe passage to the general path of travel, there is a head aisle at the head of the space. If you look at the head aisle, you can see that the parking bumper has been pushed into the head aisle. Parking bumpers are required by both the California Building Code and the ADA if parking bumpers keep the vehicle from encroaching onto the path of travel. So this space does require a parking bumper, but at the time of this photo the required bumper has been pushed into the head aisle making it into a barrier. Ideally, according to the Division State Architect (DSA), the parking bumper should sit 18-24 inches from the head aisle to prevent encroachment. If the driver sought to avoid this barrier, he could attempt to back into the parking space. Backing into the parking space is allowed by the ADA 2010 but not the CBC. However, if the space were to be used in this manner, the support column in the driver side access aisle blocks the usage of that aisle, preventing the passenger side from being able to use the access aisle. Both barriers effectively block this parking space from being an effective zone of safety to be used by someone with disabilities. If either the support column was elsewhere OR if the parking bumper was properly maintained then this space would be accessible. Maintaining your facility at all times is necessary to ensure proper compliance with the ADA. In this photo, we have some major issues. The first major issue has to do with the slope. It’s hard to tell in this photo, but the parking space is significantly sloped towards the drainage. Spaces that are sloped this greatly pose a hazard for individuals transitioning out of their vehicle. It’s hard enough to move safely in and out of a vehicle, but to also require that individual to prevent their wheelchair from rolling away while doing it is grounds for a potential lawsuit. Baring re-surfacing this space so as to be level, we must ask — Was this the best possible space? It’s not, but we can cover how to decide where a space should be in a different entry. The next two obvious issues has to do with the lack of signage at the head of the parking space and the faded “NO PARKING” in the access aisle. Both of these items alert drivers that this space is not for vehicles to park in. The “NO PARKING” in the access aisle is particularly important as desperate or unaware drivers will sometimes park in the access aisle, effectively blocking the disabled patron from re-entering their vehicle. Not having the proper warning signs opens the store owners and the property managers to a lawsuit because it’s the owner’s responsibility to monitor their spaces and call the police to tow improperly parked vehicles. Having the required signage is necessary to protect the owners should the driver of the towed vehicle claim that they were unaware that they could not park illegally. This last picture has to do with a path of travel from the access aisle to the main entrance. The subject of this photo has to do with the required extension of the handrail at the bottom of the stairs. Some of the requirements have changed slightly, but the issue with this extension has to do with the fact that it projects into the path of travel and constitutes a hazard for pedestrians. The extensions of the stairway are correct to be returned, but be extended to the ground so as to be caught by a cane-sweep. So you understand, the point of all these articles is to educate you readers about what ADA compliance entails. Both what to do, how to approach it, how to best comply and what the common pitfalls for complete ADA compliance are. Education is mostly free. I have to spent a few hours, maybe a day and a half each week, working on articles, and you have to take time to read it, to shift through the multitude of available information. Ultimately, though, we make a living doing ADA inspections and ADA consultation. We do know the laws and ADA regulations, but we don’t know your facility. I can write about the most common and glaring problems, but I can’t advise you on your particular site. Even if you submitted pictures, I can’t measure slope or spot issues you may not know about. If you find this information helpful, feel free to drop an email or a comment. Submit a picture too, if you like. I can email you back with an opinion. Let us inspect your site! But seriously, give me some genuine feedback and let me know if this was helpful or if you would like me to cover a specific topic. If I get enough requests, I’ll take the time to write an article on it. 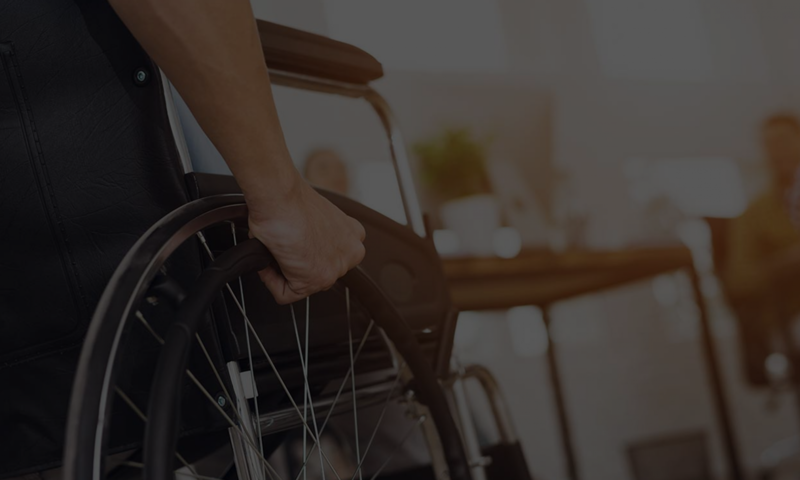 If you’re interested in having us apply our knowledge to your place of business/place of public accommodation in the form of an ADA consultation, by all means call us at 866 982 3212 or email us at help@accesssolutionllc.com.